I am not a huge fan of most Irish proverbs since they often have to do with drinking, but this one embodies a truth we have a tendency to overlook. In the past, Gwen and I jokingly complained that we’d like to find a nice rut to slip into—a place where we could roll along without any effort. But that isn’t reality, or at least—it shouldn’t be. Christian living is easy in this country—so easy that if we’re not careful we become complacent. And when we ask ourselves if that’s okay with God, undoubtedly we would say no. I am not pointing a finger at anyone, except perhaps myself. If we find that we have fallen into a rut, especially if it’s a comfortable rut, we need to pull ourselves out. At times, that may be difficult—but we must. 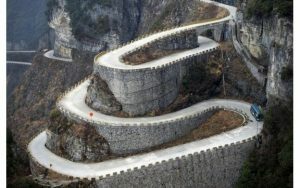 Have you ever taken a trip where you rounded a bend in the road and found something exciting or adventurous? You pull over and get involved, and it becomes the best part of your trip even though it wasn’t planned. Even though we enjoy relaxing once in a while, the unexpected turns will challenge us in ways we were not expecting—ways that we need. If we must adapt and remain clear-minded for the journey, our senses are keen instead of being numbed by monotony. For most of us, there isn’t a choice whether we take a straight path or the winding one—or is there? Jim Elliot was a man of incredible integrity who refused the path everyone else was taking. Although he had an offer for a coveted position serving as a youth pastor in the U.S., he determined to follow Christ to the Waodani Warriors in Ecuador—and it cost him his life. Jim’s wife also refused to leave that treacherous road, and pioneered the mission to the Waodani men directly responsible for savagely killing her husband. All of them accepted Christ. Neither Jim’s road nor his wife’s were courses any of us would desire in our flesh—both were filled with pain and suffering. But when we are following the path God gives us, we should never expect an easy one. I don’t mean to imply that if you aren’t suffering or poor, you’re not in the will of God. Those philosophies have come and gone throughout the ages, and could not be further from the truth. As we wait on God and seek His guidance in our lives, He will direct each of us individually what we are to do. After all, when the time comes to stand before Him on that day, there won’t be anyone standing up for us—except Jesus.